NECO's top priority is to continue to provide top quality, solid value, and excellent service to each of our customers. Their products are sold worldwide through a network of dealers, distributors, and regional warehouses. Dry & store your grain on your farm to save time and money with one of NECO's In-Bin Continuous-Flow Systems. With five different systems available, you are certain to find the system to meet your individual needs. 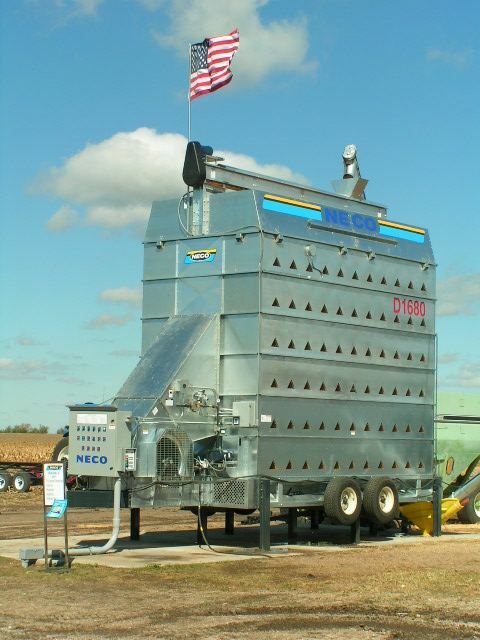 Click here to view a brochure on the Drying Systems available through NECO. NECO Continuous Flow Grain Dryers for farm & commercial bins offer a whisper quiet operation, works with all grains, and preserves grain quality. The dryers have 250-2,500 farm capacities and 2,500-8,000 bph commercial capacities. Click here to read more information about the Farm & Commercial Continuous Flow Grain Dryers. type) when operating at over 4” of static pressure. NECO Axial Fans are designed to operate at 3500 RPM for maximum axial fan performance. All NECO fans use motors specifically designed for use in axial fans and are designed to run at less than full load amperage to extend motor life and increase fan efficiency. Click here to view a complete brochure on NECO Fans & Heaters. 10. 42 Years of Industry Experience. 9. Precision Machine Shop Capabilities. 8. Complete Grain Drying Systems from in-bin to commercial continuous flow Dryers. 7. Full in of Fans and Heater for drying and aeration. 6. Complete line of Grain Handling Equipment. 4. Innovative Products and simple designs. 3. Custom Design service for special customer needs. 1. Best combination of Product, Quality, Personal Customer Service and Value.